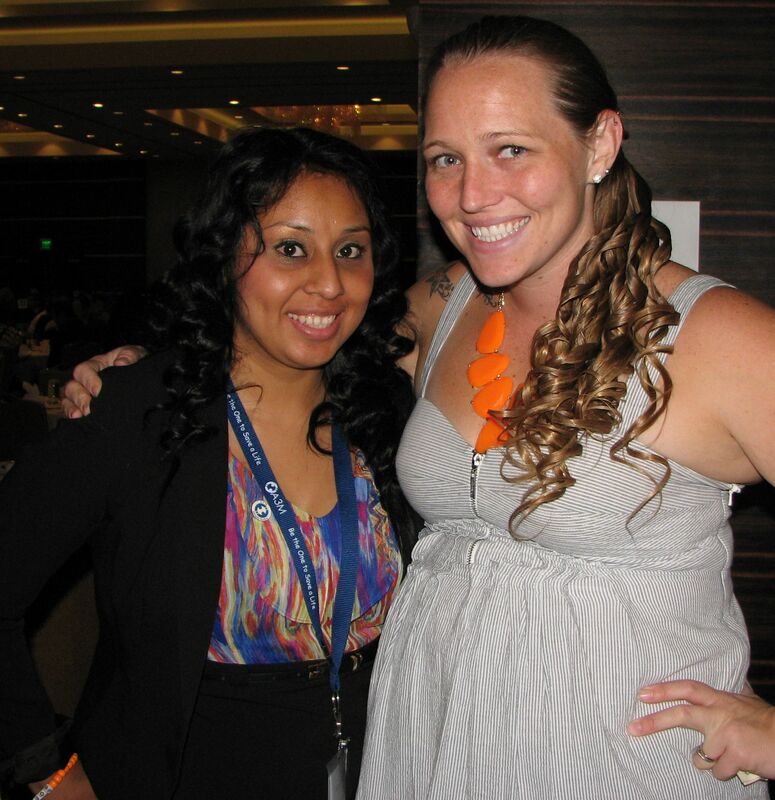 Patients, donors share their stories at A3M gala. 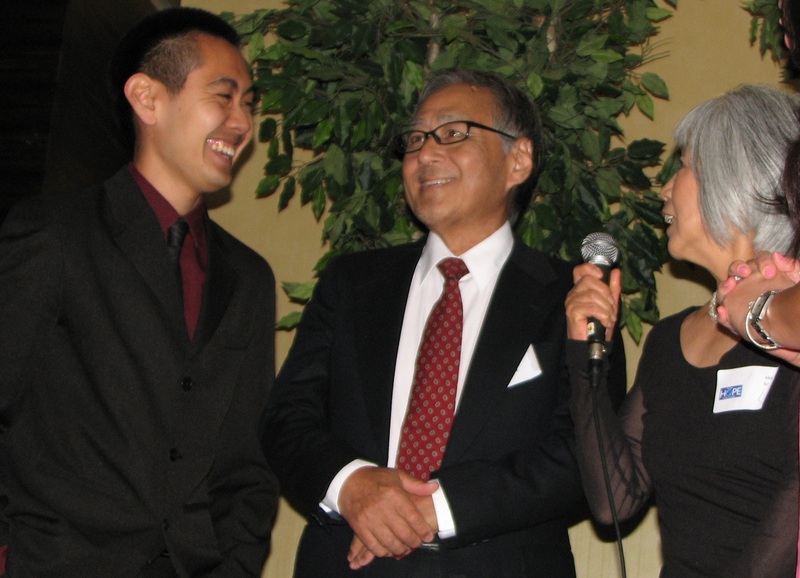 Thomas Yamamoto (left) donated marrow that saved the life of Shunzo Kotani, pictured with his wife Akemi. The two men met for the first time on stage at the A3M gala. A “reunion” between a former MDS (myelodylastic syndrome) patient and the man whose bone marrow saved his life was the highlight of Asians for Miracle Marrow Matches’ 17th annual gala dinner, held Oct. 4 at the Hyatt Regency in Los Angeles. Established in 1991, A3M seeks to increase the number of Asians and other minorities on the national bone marrow donor registry. Many life-threatening blood diseases can be cured by a bone marrow transplant, but there must be an exact tissue match between patient and donor, and the best chance for a match is among people of the same race/ethnicity. Donor drives are held regularly at Asian American community events, and advances in technology have helped. In 1991, a nurse needed to be present to draw blood samples for testing. “A few years later, we went to a finger prick … Now it’s as simple as a cheek swab,” said Ito. One of the patients who received a successful transplant is architect Shunzo Kotani, 65, who came to the U.S. from Japan over 35 years ago. He was diagnosed with MDS around 2009 and was kept under observation. Last year, he began feeling more out of breath than before, he bruised easily, his speech was inaudible, and he could not hold his chopsticks. He underwent brain surgery, but also needed a marrow transplant. After no family members were found to be a match, a search for unrelated donors began, and three possible matches were found within a week — “a miracle,” Kotani said, since searches can take months or years. One was unable to donate, narrowing the list to two. The donor is Thomas Yamamoto, 22, who signed up for the National Marrow Donor Program in March 2013 on the USC campus. He was surprised to get the call only three months later. He initially said no but changed his mind. The Song family — parents Alice and Daniel, daughter Claire and son Timothy, who underwent a bone marrow transplant in February 2012. “I’m so excited to meet him. Maybe I’m crying,” Kotani said just before he was introduced to Yamamoto on stage. The two embraced as the audience applauded. Asked if he felt like a 22-year-old, Kotani said, “Yeah, I feel young.” He also noted that his taste in food has changed, such as liking chocolate more — one of Yamamoto’s favorites. Dador joked that the two should discuss Yamamoto’s habits so that Kotani will know what else to expect. Alice Song spoke on behalf of her son Timothy, who received a marrow transplant 2½ years ago at the age of 2 and is now healthy and thriving. 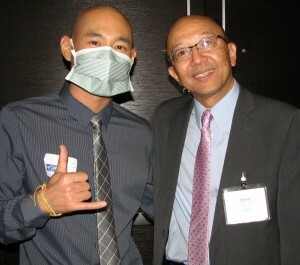 Leukemia patient Alex Tung and A3M Director Shin Ito. She later learned that the donor was a non-Korean woman living in Germany. 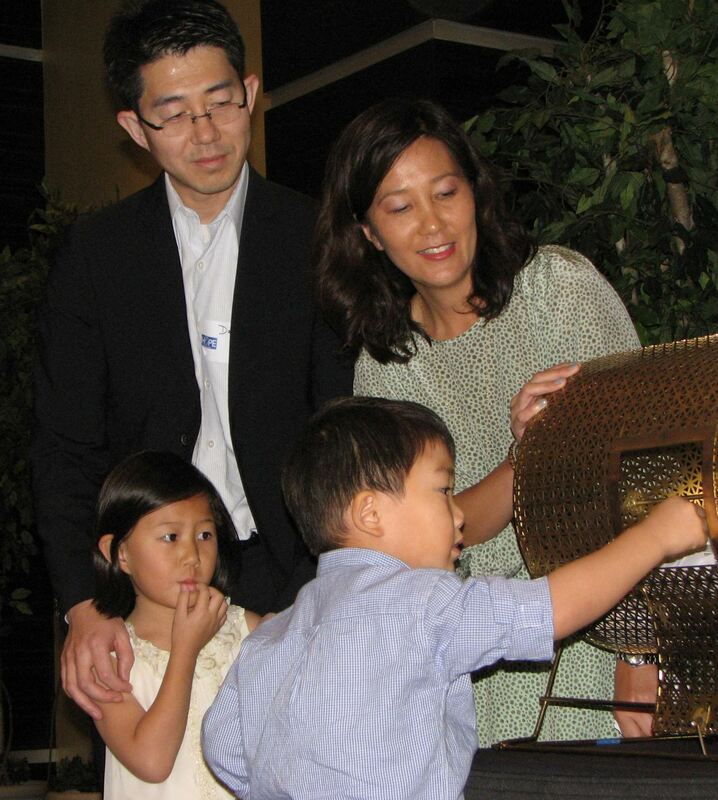 The whole family, including Timothy’s father Daniel and sister Claire, participated in the raffle drawing. Erica Westfall represented her late daughter, Sofia Flores, who was born in 2011 and diagnosed with a rare form of leukemia when she was 19 months old. Erica Westfall (right), mother of Sofia Flores, with Rosana Flores, A3M’s Hispanic outreach and recruitment coordinator. Sofia endured intubation for a collapsed lung, blood transfusions and chemotherapy. A haploidentical transplant from her father, Ignacio, who was only a half-match, was attempted. Transplant survivor Nancy Sakakura and event co-chair Gene Kanamori. 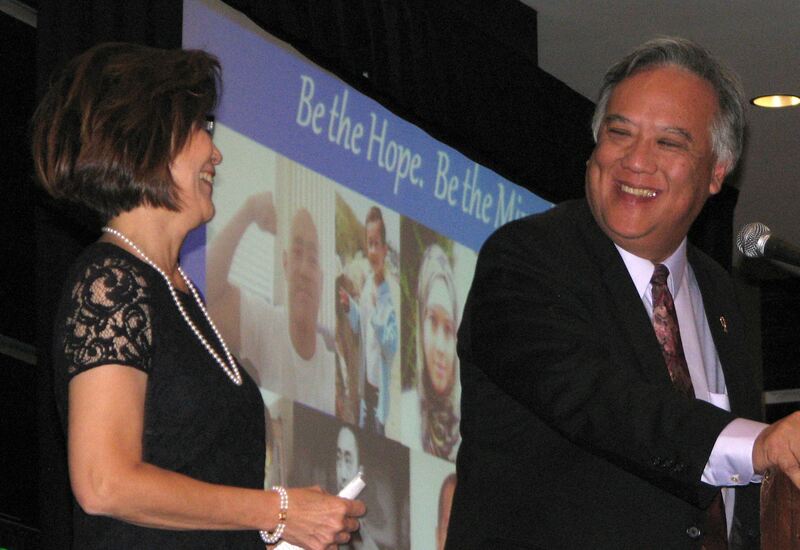 Ito paid tribute to Sheri Olmon, a non-Hodgkin lymphoma patient who was one of A3M’s first mixed-race clients. She received her transplant 15 years ago and continued to volunteer with A3M until her death due to a car accident earlier this year. Her mother, Elsie Myers, attended the gala. Ito also thanked Ken Lin, who donated marrow to a patient who is now out of the hospital and at home recovering, and Derek Inouye, who joined the registry as soon as he turned 18 (the minimum age). Derek is the older brother of Dale Inouye (1998-2008), for whom the Dale M. Inouye Foundation is named. Co-chaired by Gene and Vickie Kanamori, the event included an appearance by Bell Tsou of LA 18’s Mandarin talk show “Midday Buzz” and a performance by Leisure Brown, which consists of Jason Arimoto on ukulele and Brad Ranola on percussion. For more information on registering as a donor, call 1-888-A3M-HOPE (236-4673), email [email protected] or visit www.a3mhope.org.